As we were chatting to the friendly lady who runs the Boathouse, she let slip that she'd recently been across the water to check out some new competition. Our petite pixie ears pricked up: ooh, new place? Yes indeed, she confirmed, and pointed (like something out of Invasion Of The Body Snatchers) to the 'Stowe. 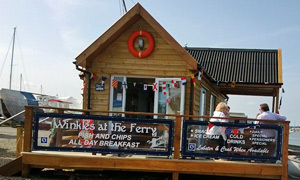 Specifically, to the boatyard, home of the recently opened Winkles At The Ferry. Ooh-err! Word on the water is that WOTF was set up by an ex-employee of Ferry Cafe, a veritable veteran of that vicinity. Now there's a pebble's chuck between the old guard and the young Turk. Apparently built from an old shipping container, Winkles sits like a pouting Marlon Brando, squarely on the waterfront. There's seats inside 'cos it's not always going to be sunny, but today the cooler kids are on the plentiful outside tables. Bit of a bunfight to order inside, truth be told, jostling for position and trying to avoid getting poked by kids inspecting the fishing nets. No great surprise since school's out and it's a scorcher. Whereas the View Point Cafe give you a plastic bucket to confirm your order number, here it's a polished stone. Out to our bench we go to sip from cool cans, feel envious of the ferryman, and wait. And wait. As I said, the world and their grandchildren are down here today, and it's a lovely spot to sit and watch the waves. Those order numbers creep up until eventually our plates materialise. Well worth the delay for some tastefully presented and mighty tasty ham, egg and chips. Couldn't quite run to today's special, the lobster. Shame that it's another of those Fridays when we really should put in a token reappearance at the office. Off we drag ourselves but not before getting some coffees to go -- good 'n' hot -- plus some cake to share. To cap off a fine outing, there's an almighty noise as a Vulcan bomber soars overhead en route to the Clacton air show. Woah. If it was a car -- NSU Ro 80. If they were passing by -- Roy Hudd.